Exiled from her tribe for making a Druidic staff, Titian and her dying friend, Myriam, are taken in by the Clan and Kindred. But theirs is a turbulent world, edged with war. being pursued, as her old world seethes in turmoil Titian begins a perilous journey - into an unknown destiny - to find the mythical Fragrant Moss, the only thing that might save her friend, that legend says grows only in the Land of the Rainbow’d Sun. 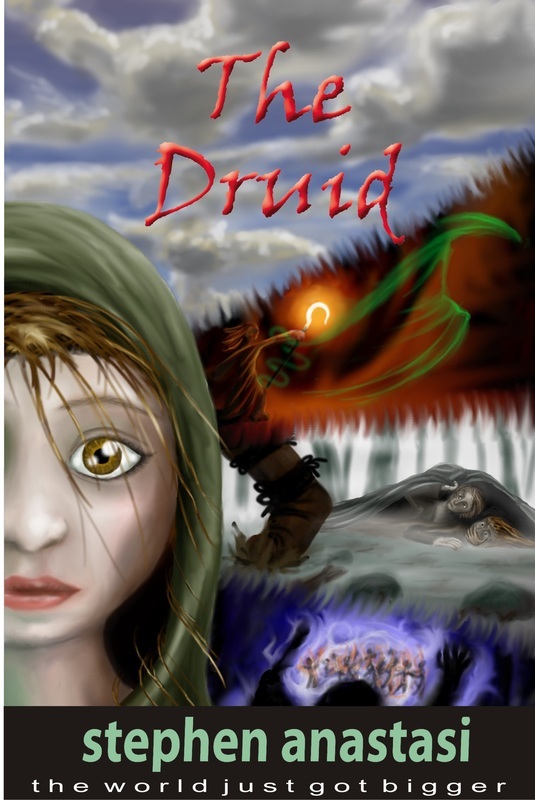 Set in the far distant past, The Druid is the story of a girl’s rites of passage into a new world, as it parallels her journey toward adulthood. This is a beautiful, exciting, elegant book that you will love. The Druid: Adventure One of the Trilogy– The Land of the Rainbow’d Sun. girl cowered by life, but mostly by Cook’s cruelty. She appears weak because she’s downtrodden, but in fact has a strong mind and spirit, and is a deep-thinking and compassionate being. that was once abundant but which has disappeared from sight long ago. Mystal dragons which she has come to love that flow though the mist when she sits with the sheep. These long days alone are filled with carving and shaping a staff fashioned from a fallen oak branch. The carver’s talent will lead to a shift in her life. a sole ambition to kill and conquer, believe she is a healer and she is taken. Escaping from her captors, Titian begins an astonishing quest bound to and by the staff and the dragon carved thereon. This quest will see Titian lead her people through fighting, death and finally freedom, and see her challenged by change, adventures of discovery, and the greatest evolution of self. to the author’s other series currently released: The Runes of Ire: Adventure One of the Mathemagicians of Yore. The two half faces of each book, one of each main character, join together to make one face. A highly inventive and eye-catching parallel. Titian ran. She ran so hard the cold cut her, her eyes shed tears, the backs of her heels bumped against her backside. Blind, shaking panic. At the edge of the clearing, she glanced backward. Out of the slowly drifting fog they sprang, closing the gap. She hammered on into the quickly thickening woods, praying for a break, a chance to escape. But this would not be. As if by magic, a dark figure leapt out of the ground at her feet and caught her about the waist. She made to scream, but a hand clamped her mouth as the other threw her hard to the ground, and slapped her into silence. There were two kinds of monster in Titian’s life - the Mystals and the Swarthymen. The first she loved, the second she feared. Perched on Lonely Log, like a frog on a rock, she had not known that both were close: one pressing in from the mist above, and the other in the fog at the edge of the grazing field. different was very much how she wanted things to be. A sheep bleated in the fog - white on white. Titian looked carefully about, fleetingly fearful that one of her tribe might have come to check on her and would catch her working on it - her staff. This was a great worry, for it could mean a severe beating, exile from the tribe, or even sudden death. Though the tribe respected the carvers, the Nangar druids, that respect was edged with and born of a fear of their powers, so any practise of their arts was outlawed and received a most harsh reaction. She relaxed again: the likelihood that someone other than Myriam would check on her was nearly zero. No one cared. Titian’s head tilted skyward and she searched the thready vapours. She was very young when Myriam first showed her pictures in the clouds: sheep, and goats and funny men with long noses. It was a game they played when Titian tired of learning the herb lore. But the Mystals were different - they weren’t made of clouds, there were in the clouds. And she was alone when the morning mists first brought the Mystal dragons. Before that day, she had never heard of dragons. Neither had anyone else but the name popped into her head as soon as she saw them, as though they themselves had put the name there. At first, watching them made her head ache, for she could never see them by looking straight at them. When she did, they just turned into mists and magic, a dream she could not catch. But with practise, she learned to watch them by looking away: see them with the edge of her vision. Still misty, yet she saw more and more until she knew every floating curve, even their strange, other worldly, cat-like eyes. She had told Myriam about them, even pointed them out, but Myriam never could see them, even when Titian taught her how to look away. In the end, they decided that either Myriam did not have the talent, or that Titian was mad. They laughed at that. Recently the Mystals seemed fainter. Titian worried that being older was the real reason that Myriam couldn’t see them and she feared that in time they might fade altogether. ‘Then you’ll see the world as the harsh reality that it really is,’ Myriam warned. Titian wasn’t sure what this meant, but this was a reality she didn’t want to know. A glance at her tattered clothes made any strangers to her tribe see this truth clearly. They usually hurried past wondering how long it would be before she was lost to the tribe, taken by starvation and cold. her. But they were only ever in places that only she and Samson frequented and her heart said it was him. Even with this help, Titian was wraith thin. But as long as she could see the Mystals, she felt there must be a world somewhere that she could run to in times of trouble, where her vexed spirit could find healing. They played now, as they always did, just out of her line of sight, colourful swirls in the dancing fog. She took a last look at their frolicking forms, catching the sweep of their long necks. She steadied her shivering arms, put a last touch to her work with sharpened flint, and held it up. It was done. at her. Knowing a little of the lore of the druids of Nangar she carefully kept the mistletoe and the scrapings of wood from her carving. Myriam had taught her the lore - passed down from her mother while she was still alive. her the mightiest druid of them all. But there was still the matter of magic - she had none. By this second standard, her staff was just a fancy looking pole. She hadn’t figured that part out yet. She saw one nearer now. Swarthymen. Her throat went dry. A raiding party to take the sheep to eat, or a girl for slavery - or to eat; she had heard the stories. Quietly she backed away, praying to the Earth Mother that they would not see her. A shout and the chase was on. She spun and sprinted for the woods. ‘Stay quiet or we’re dead,’ whispered the one who had caught her. She turned sharply. Her captor was not a Swarthyman at all, but a boy not much older than she. Even as he spoke, he threw a large cloak over them both. ‘Stay very still’ he breathed in her ear. Scant seconds later she heard heavy footsteps gallop up, then rush past. One of her pursuers even jumped over them, cursing about rocks as he did so, for as he leapt, the boy cracked the Swarthyman’s foot with his staff. Titian was bewildered, for it seemed to her that they were in plain view. ‘How did you do that?’ she asked, eyes wide. She looked at his cloak, that seemed smaller now it was on the boy’s shoulders, hardly enough to cover two people; surely a trick of the eye. This second secretiveness both rankled and enticed Titian. It hinted at a world she would never know, but one that filled her dreams. ‘I must be running,’ she said. ‘Why so soon?’ he asked. ‘I shouldn’t worry,’ said the boy. ‘Why ever not?’ she asked, irked by his casual reply. If she lost any sheep, no matter whether it was her fault or not, Cook would make sure she paid dearly, with the whip. evil eye. Perhaps the chief was right. Perhaps he was a sorcerer in boy form. ‘How did they get here?’ she said. ‘Whatever shall I tell the clan?’ said Titian, unconsciously tugging at the rabbit pelt cover of the staff. It suddenly fell away. ‘It’s mine!’ squeaked Titian, suddenly fearful. But he would not let go. ‘You made it?’ he said. Doubt coloured his words. From a pocket, he drew a leather piece and lay it over a mossy rock. There he sat and invited Titian to sit also. For what seemed an age, he studied the staff, sometimes smiling, sometimes serious, like a child listening to a favourite story. Titian had left the whole of the base bare, and whittled it into a pole shape, two or three thumbs thick. But the top, where the bulk of the wood was, had figures laid one over the other. She had taken advantage of a natural curve in the crown to create a sheep’s crook. Beneath the arch of the crook, the image of a young girl held a staff like Titian’s. From that girl’s staff another girl emerged at its crown, as though the figures carried on, one to the other, forever smaller. tightly. From its head, spikes jutted out, one up from the front of its snout, others from the sides of its face, like a mace. Both girl and dragon looked out at the same point, two thoughts in one. The boy had never seen its like before. He held it high catching a sunbeam. ‘Yes ... I … ’ she didn’t know what else to say. He nodded toward a place behind her. She turned in alarm, fearing that there might be Swarthies sneaking behind. Not a moment later, she turned back and found him gone - as was the leather piece on which they had sat.